In this funny and tender memoir, South African icon Pieter-Dirk Uys reveals the person behind the persona. We meet his forbidding, musically driven Afrikaner father, his brilliant but troubled Berlin-born mother, and Sannie Abader, his Cape Flats ma who raised him in Pinelands, Cape Town. Filled with photographs from the family album and Uys’s 40 years in theatre The Echo of a Noise also features Pieter’s Paarlse ouma, his strudel-baking German Oma, his devotion to Sophia Loren, the invention of Evita Bezuidenhout, and the joys and sorrows of a remarkable life. **** It’s a South African story like no other ... a journey that stays in your mind as you ponder your own place on the tip of Africa. Hierdie bundel bevat vyf van Pieter-Dirk Uys se Afrikaanse dramas wat by verskyning aandag getrek het oor Uys se se satiriese uitbeelding van en kritiek op die apartheid-stelsel, nl. Selle ou storie, Karnaval, Die Van Aardes van Grootoor, Panorama en die Die vleiroos. Die selle ou storie en Karnaval is destyds deur die Publikasieraad verbied. “Uys is enig in sy soort, ’n man wat in ’n tyd toe monde gesnoer is, nie bang was om te skryf wat geskryf moes word nie." A white comedy or a black tragedy? Whose side will you find yourself on? For twenty-four hours in 1987, Sibi Makhale is allowed to visit her dying father in the maximum security prison of Robben Island. The daughter of banned parents, Sibi comes face to face with two suspicious and frightened white Afrikaans schoolteachers resident on the island. It will prove to be a life-changing experience for all of them. Over two decades later, Sibi returns to the island – now a World Heritage Site – with her two born-free sons. It is an attempt at closure for her, an adventure for her boys, and for the reader, a remarkable journey back from the dark past. Panorama celebrates the people who, through their shared passion for a beloved country, managed to communicate and even laugh with each other in spite of fear, guilt and prejudice. This story about South Africa’s yesterday and today is inspired by Pieter-Dirk Uys’s internationally acclaimed play of the same name. South African icon Pieter-Dirk Uys has been on stage over 7000 times. In this funny and tender memoir, filled with photographs from the family album and 40 years of satire, Uys reveals the person behind the persona. We meet his forbidding, musically driven Afrikaner father, his brilliant but troubled Berlin-born mother, and Sannie Abader, his Cape Flats ma who raised him in Pinelands, Cape Town, and learn of his friendship with Sophia Loren, the invention of Evita Bezuidenhout, and the joys and sorrows of a remarkable life. Hierdie bundel bevat vyf van Pieter-Dirk Uys se Afrikaanse dramas wat by verskyning aandag getrek het oor Uys se se satiriese uitbeelding van en kritiek op die apartheid-stelsel. “"Uys is enig in sy soort, ’n man wat in ’n tyd toe monde gesnoer is, nie bang was om te skryf wat geskryf moes word nie." Robben Island revisited: Pieter-Dirk Uys’s incisive and moving new novel that updates his remarkable early play of the same name, which was first performed in 1987. When the history of apartheid is ever written, the wife of the National Party MP for Laagerfontein will have her own chapter. Here is her story, the truth and the spin, the sublime and the ridiculous. The story of a woman. The story of a nation. The story of our lives. Her story features, among others, Marlene Dietrich, Ava Gardner, The Beatles, John F. Kennedy, Marilyn Monroe, Nelson Mandela and Evita Bezuidenhout as herself. In this funny, witty and poignant memoir, Uys takes us on a journey through his life in the theatre — and the theatre in his life. This is a book about journeys, both geographical and personal, a document of Pieter-Dirk Uys’s love affair with South Africa and its people. Frank and controversial, hilarious and humane, Elections & Erections expresses his passion and anger towards present circumstances and his hope and optimism for the future. 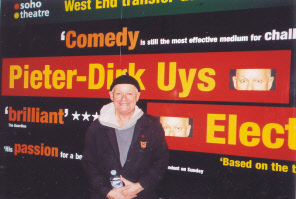 Pieter-Dirk Uys has been commenting on South Africa, its politics and people since 1980. His collection of work is available on DVD at major outlets in South Africa, as well as at Evita se Perron and the Darling Spar. "This delightful cookbook [is] a unique collection of mainly South African recipes and some others, lovingly presented." Evita se Perron has the most extensive museum/nauseum on apartheid in the world. Apartheid is now being taught in schools and there are no objective books. The "born frees" (those born after 1994) cannot understand the madness, the monsters or the facts. Bring them to the Perron and let PDU take them through his version of history, laced with humour, but based on reality and pretty close to the truth. Join PDU and Tannie Evita in supporting the work of The Darling Trust.